The Panasonic Shinobi Ultra is not a bad television, but it's not cheap either. Priced at over Rs. 1 lakh, it seems to make too many compromises to tackle competition. There are better TVs available in the above Rs 1 lakh price range. When it comes to television, Panasonic is sort of the original value for money contender. The company has never really undercut prices the way Vu, TCL etc. do, but it’s routinely remained below the Samsung, Sony and LG prices. It’s not that Panasonic doesn’t have expensive televisions, but even its most expensive TVs cost less than its competitors. It’s somewhat like the Motorola of the TV market. We reviewed the Panasonic Shinobi Pro (review) last year, and though all of the above was true for that TV, it lacked the brute force of high resolution. That’s exactly what the Shinobi Ultra EX600D solves this year, proudly sporting 4K HDR resolution, combined with the company’s Hexa Chroma Drive technology. But that also drives up the price, and starting at Rs. 78,000, the Shinobi Ultra would make for a difficult decision for many. Hence, here’s the review. 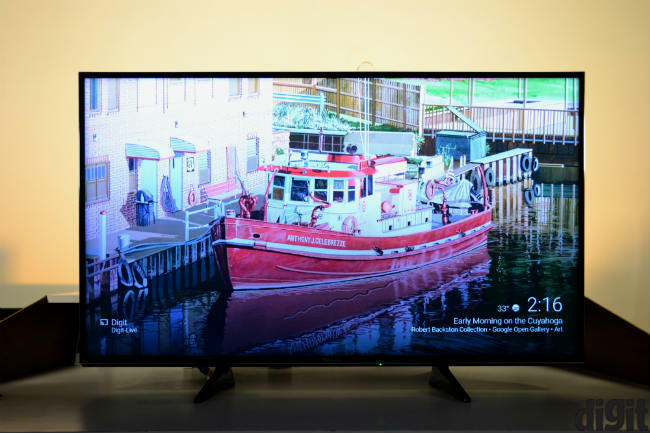 The Panasonic Shinobi Ultra EX600D is not a budget priced television, yet the company chose a simplistic and utilitarian design. You get plastic all around, and truth be told, it looks somewhat cheap for the price. The edges are thin enough, so it’s still immersive, as long as you’re watching from the right viewing distances. Setting it up is rather simple, with the stand fitting at the bottom. You put in a few screws and the TV is ready to go. It’s also easy to move when you need to, since it’s much lighter than most televisions with its specifications. We were able to easily move the TV single handedly, without requiring any help from others. All the ports remain on the back of the television, and there’s no wobble once the stand is set up. Unless you’ve made a mistake in fixing the stand, the TV should hold upright on your media centre. All in all, the Panasonic Shinobi Ultra is a TV for those who don’t really care about how stylish their media centre looks. It’s a simple and utilitarian design that may not add flash to your setup, but won’t hamper it completely either. The more expensive variants in Panasonic’s arsenal do look better. A plastic, but chrome finish would have made this TV look better and suit its price. As far as port placement is concerned, both the USB ports face sideways on the television, and they’re accompanied by an HDMI port. 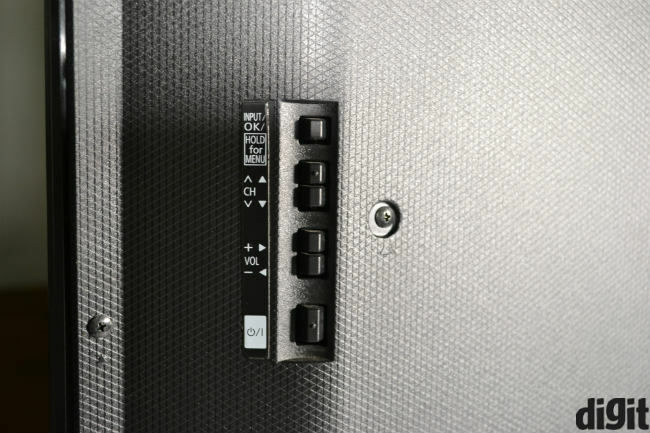 These are easy to access, but every other port is placed on the back, facing downwards, making them difficult to reach. You would want to use these ports for devices that are going to be permanently attached to the TV, like a set-top-box. 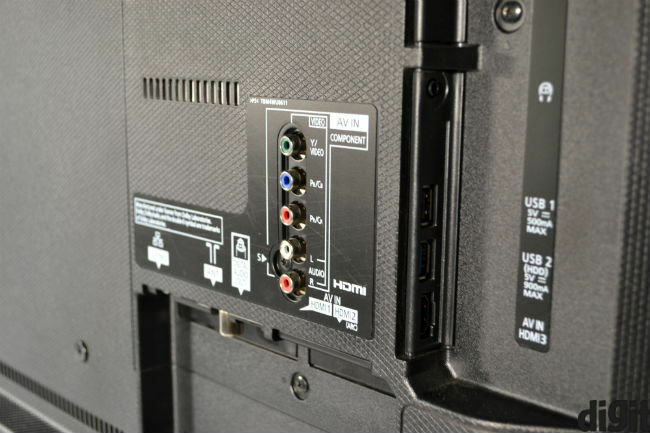 All the HDMI ports are HDCP 2.2 compliant, so you will have to ensure that every link in the video chain will need to be compliant as well. That’s usually easy to do though. It’s also worth noting that only one of the USB ports is of the USB 3.0 standard, while the other only supports USB 2.0. Considering all of the above, we have two qualms with the EX600D. The lack of more USB ports, especially those supporting USB 3.0 standard, is worrying. Also, at least one more HDMI port should be available on any high-end television. Panasonic’s TV may be cheaper than competitors, but it’s not a cheap TV for sure. There’s also a slight issue with the company’s remote. 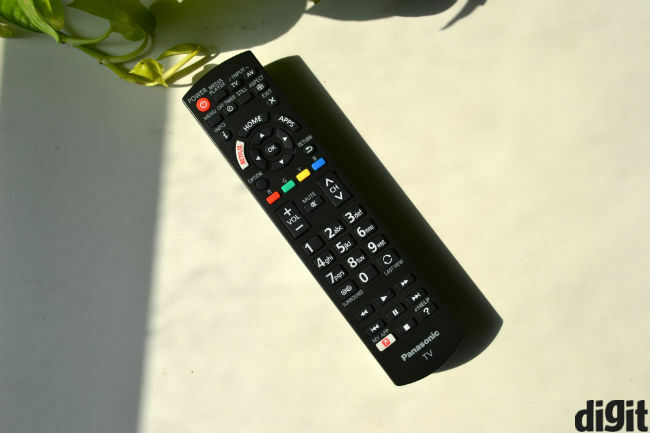 Panasonic designed a pretty standard remote, but it sometimes fails to send signals to the television seamlessly. We tried with different, out-of-the-box batteries, but connectivity with the TV seemed choppy. It’s not unusable by any stretch of imagination, but it lacks the seamlessness we would have liked. With LG, Samsung and Sony pushing their stylish and smart remotes, this could come to hurt Panasonic. The remote has a Netflix button, for easy access to said content. Other buttons are quite tactile, though you do need to press them a tad hard. In our experience, all of the above has always been true for Panasonic’s TVs. That said, the company usually hits it out of the park with superior picture quality. So, when we were told that this TV would support 4K HDR resolution, it was an exciting proposition indeed. Our experience with this television has been somewhat mixed. Panasonic’s Hexa Chrome Drive technology provides wider colour gamut and the company has revamped it for 4K resolution this time. It still gets the job done too, with nicely oversaturated colours, which many would call vivid. That said, it’s very important to provide high quality content here. Out 30-odd GB rip of Star Wars looked great, but truth be told, we’ve seen better. The Shinobi Ultra is good to look at, but you’ll not get the highest contrast ratios out of it. At 50% brightness, we tested readings of 570:1 contrast ratios, which is low, especially for an HDR television. We also found the TV’s brightness to be a tad low, though many wouldn’t notice it. The problem though is that for an HDR television, brighter is always better. Overall, the Panasonic Shinobi Ultra can produce decent picture quality, but we somehow expect a tad more at this price. Like its design, the picture quality doesn’t quite dazzle, which could be an issue at these prices. The 49-inch variant that we reviewed is priced at Rs. 1,41,000 and that’s not pocket change. 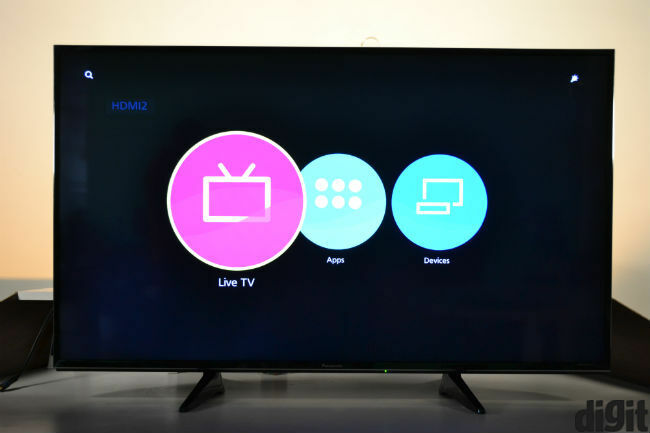 The EX600D is also a smart television, running on a forked version of Firefox OS, that is meant for TVs. It doesn’t make much of an impression by way of appearance, but it’s a functional UI indeed. You can press the “Home” button on the remote to access apps and connected devices (like hard drives), and the UI doesn’t really depend on home screens. It’s a pretty responsive UI, which is a welcome aspect of the television. We didn’t experience long wait times while navigating the UI. So, while Panasonic’s software may not be the most sophisticated or advanced, it’s functional, like the rest of the TV. The Shinobi Ultra EX600D uses two bottom firing 10W speakers to deliver audio, and it isn’t great at that. While the television can be loud enough for small and medium sized rooms, it won’t do for larger ones. The speakers also lack good bass support, which comes in the way of watching action movies and listening to music often. The TV will do fine for dialogues, but that’s about it. And Panasonic is well aware of this, which is why it bundles the 49 and 55-inch variants of this TV with the SC-UA7 home audio system. The SC-UA7 is meant to improve bass response for the television, but you have to like loose bass to enjoy the audio quality. It does a decent job for listening to music, but we would really recommend better home theater systems or speakers to go with this TV. The SC-UA7 makes the Panasonic Shinobi Ultra EX600D louder and clearer, which is enough for most, but nitpickers and audiophiles will want better. 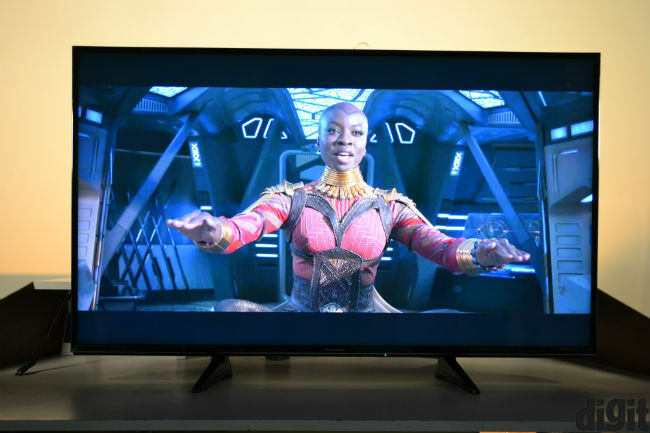 When we reviewed the Panasonic Shinobi Pro last year, we thought it was a value for money 1080p alternative to the expensive 4K televisions. However, the Shinobi Ultra EX600D enters the elite 4K HDR club and breaks the Rs. 1 lakh range. At this price, you expect only the best and literally no compromises make sense. You can get similarly priced and sized 4K HDR TVs from LG and Sony at this price, and they’re both better than Panasonic’s offering. 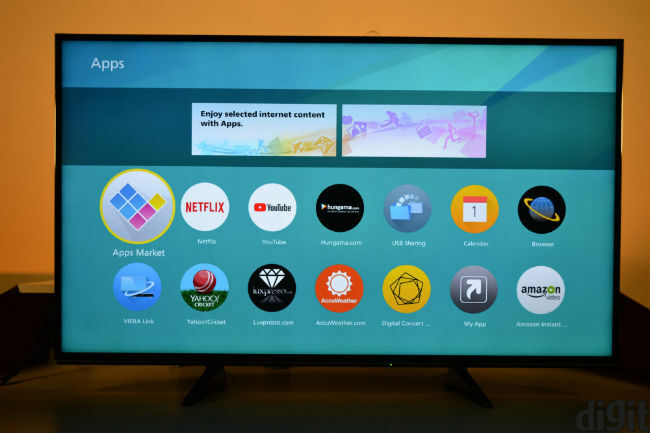 Essentially, while the Panasonic Shinobi Ultra EX600D is a functional television and it does the job, but that just doesn’t work in this price range.